Daniel Summerhays, pictured acknowledging the gallery after completing his round, survived a bogey on the 18th hole of the Nationwide Tour's Stadion Athens Classic at UGA to take a one shot lead over Martin Piller and a two hot lead over New Zealander Bradley Iles. 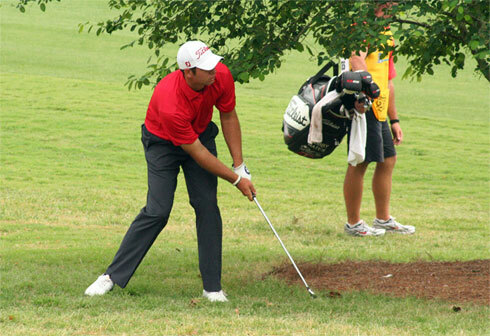 Summerhays shot a 6-under par 65 on Saturday to give him a three round total of -13. 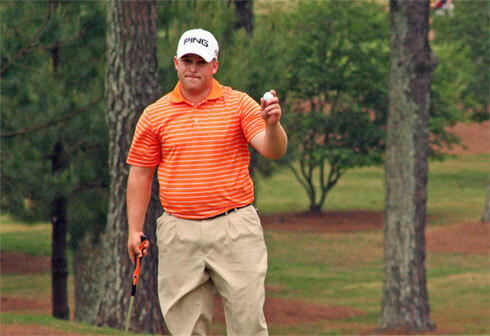 Thanking the Gallery: Nationwide Tour Pro Daniel Summerhays acknowledges the gallery after completing the 3rd round of the Stadion Athens Classic at UGA with a one shot lead after shooting a 6-under 65 to get to -13 for the tournament on Saturday, May 1, 2010. Eye on Sports Media/2010. Because of weather concerns, Nationwide Tour officials decided to play the round in threesomes, with players teeing off of both 10 and 18. This allowed play to finish around 2:30 PM ET Tomorrows final round will return to traditional two-somes. Play with start, however, with Ramon Bescansa (+6) playing by himself as there is an odd number of players remaining in the field. The shot of the day came from Skip Kendall, who aced the 192 par-3 second hole at the University of Georgia Golf Course. He was unable to build on this and played the remaining 15 holes at 5-over par, including a triple bogey on the 561-yard par 5 12th hole. For roller-coaster golf fans, Scott Gutschewski played a stretch of three holes that would leave anyone dizzy. After an eagle on the356-yar d par-4 11th hole, he triple bogeyed the 12th, and then birdied the 209-yard par-3 12th hole. He finished his round at 3-over par 74, dropping from a tie for 19th position to a tie for 46th place.